Platinum is bright, shiny and resistant to tarnish. It can be used to make beautiful jewelry, labware, and even the outside casings of implantable medical devices. For those reasons, many people believe that the only way to produce a piece of platinum - be it a ring, a lab crucible or anything else - is to cast it in one piece. For centuries, gold has been thought of as the greatest, most beautiful and most desirable metal in the world. That concept has entered popular culture in many ways. When a product or commodity is spoken of as the best of its kind, it is called “the gold standard.” When athletes compete at the Olympics, the first-place winners are awarded gold medals. And through the ages, many events have happened because of gold. There was the Gold Rush of 1849. Centuries earlier, Spanish explorers sailed to the New World in search of El Dorado, a city made of gold. We have written a lot on our blog about the most common places to find platinum scrap, including catalytic converters, lab equipment, and thermocouples. Platinum-plated jewelry has unique properties that are often misunderstood. 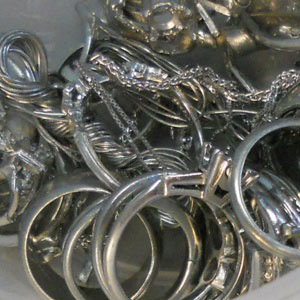 If you own quantities of platinum-plated jewelry or platinum plate scrap, here is some critical information you need to know about recycling it . . . Shown: Jewelry and jewelry scrap containing platinum and other platinum group metals like rhodium that our customers have sent in for recycling and refining. Unlike karat gold, sterling silver and many other kinds of jewelry, platinum-plated items cannot be reworked or redesigned. Because the platinum has been applied as a plating, any attempt to heat, hammer or reshape a piece will result in a disastrous failure. Any attempt to stretch them a size larger will result in the same kind of catastrophic failure that we described just above. Plus, platinum –plated rings cannot be cut and remanufactured into smaller sizes. So if you have a number of platinum-plated rings on hand, you need to send them to a qualified platinum refinery like Specialty Metals Smelters and Refiners for recycling. It does sound like “platinum plated jewelry” can only be one kind of material. But in reality, platinum can be plated onto gold, silver, and even a soft metal like copper. Obviously, 100 pounds of platinum-plated silver jewelry will be worth much more than 100 pounds of platinum-plated copper items. The only way to know how much your items are worth is to send them for testing at an experienced platinum recycling company. It is a myth that anything coated with platinum cannot tarnish. If the layer of platinum is too thin, it can wear away and expose the metal underneath. The result? An “untarnishable platinum-plated” piece of jewelry that tarnishes, changes color, or irritates your skin. Platinum-plated metals can sometimes be plated with an additional thin layer of rhodium, which is even harder and more corrosion-resistant than platinum itself. Sometimes this additional layer of rhodium has not been disclosed by the manufacturer, and the piece will only be labeled “platinum-plated.” How can you tell? You need the services of an expert platinum recycler like Specialty Metals Smelters and Refiners. Prices for platinum are on the rise, so you need to know all you can about recycling this precious metal. Call us at 800-426-2344 to learn more. What Happens when Platinum Meets Rhodium?